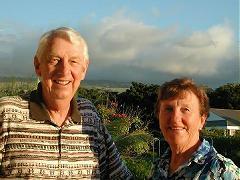 Mary and I had a wonderful week in Hawaii as part of a Lake Wildwood Golf Club excursion. 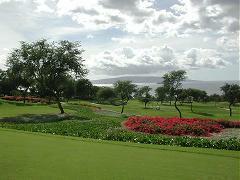 It was probably more fun for me than Mary, since three rounds of golf, one at each of the three Wailea Golf Club courses, was the central theme. Nevertheless, our afternoons were free plus three full days for sight seeing and enjoying the beaches. To set the stage, I begin with a picture of the Hawaiian Islands to orient you (and me) to where we were. Maui is shaped like a bust statue, tipped to the west with the head at the northwest end, southeast of Molokai island (a small part of which is in the top left corner of the above map). Our activities during our stay involved several places as follows. Directly west of the head is the island of Lanai. The town of Lahaina, on the forehead, faces directly toward Lanai. The airport is in Kahului, at the back of the neck. Ma'alaea is on the chin, and the neck below the chin is Ma'alaea harbor. 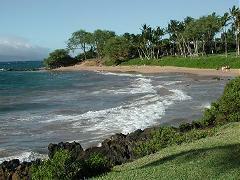 The bust below the chin is a shoreline oriented almost north-south, beginning at Kihei and extending past Makena. 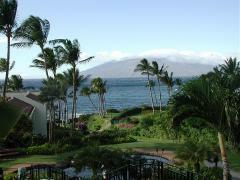 At present, almost the entire shore from the Ma'alaea harbor to Makena is lined with resorts, except for a bird sanctuary in the neck region where the Maui electric power plant is located. The island west-south-west of Makena is Kahoolawe (no name is given on the Microsoft Streets98 map; free beer to Len Schwer, the first to send a message to me with the name!). I mention this because this island appears in several of the pictures I'll show. The little speck of an island between this and Makena is crescent-shaped Molokini, which I do know because we went snorkeling there with the Watsons several years ago. This also appears in some pictures. The Grand Champions Villas are in Wailea, which is just north of Makena but not called out on this map. 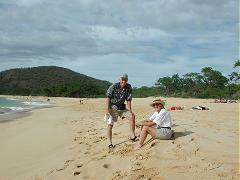 Most of the beach area to the north is called Kihei. As in California developments, there are no clear demarcations between the towns indicated on the map -- Kihei Road is just a big string of resorts, and becomes Wailea Alanui Drive to the south. 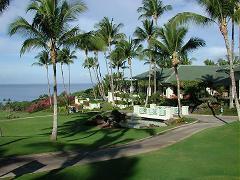 The Grand Champions Villas are east of this road, about a half mile from the beach, opposite the Outrigger resort. North of the Outrigger is the Elua Village condominiums on the beach, where Barbara and Andy and family stayed two years ago. South of the Outrigger is the Grand Weilea Resort, a huge place with swimming pools that have waterfalls, bars, a Tarzan swing into the water for the kids and so on. If you've walked the public access promenade along the beach you've seen all this. I've broken the description of our stay into three Web pages, linked from the thumbnails below. Click on the picture titles to go to each page.